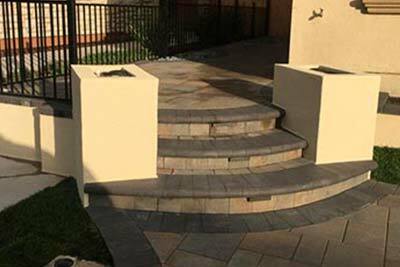 Services - Contra Costa Pavers Stone and Landscape Inc.
Our stone work services include the construction of driveways, walkways, steps, landings, patios, pool decks and more. We have experience installing a vast arena of products including pavers, concrete, porcelain tile and pavers, travertine and slate. Many of the installation processes and material choices allow a twenty five year warranty against installation failure. Some materials have lifetime warranties directly from the manufacturers. Call us now and enjoy the benefits of working with a team of experts that go the extra mile every time, every project. We have experience in segmented walls retaining and non-retaining, planter box walls and seating walls. Walls and columns serve a number of purposes. Materials and drainage choices are made with specific desired results. Our expertise can guide you to the correct choices to provide outstanding results in appearance and function. Warranties are available from 5 to 10 years. 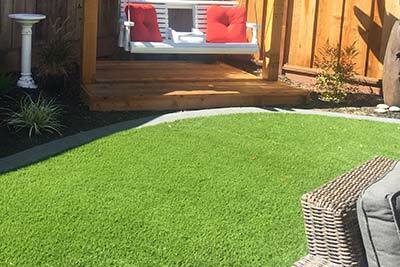 Artificial turf is available in a number of color and styles. Choices are available for putting greens, pet needs, play grounds and general purpose needs. Our expert team will prepare the area professionally to assure years of beauty and function eliminating any need for regular maintenance and water use. Warranties are up to fifteen years depending on manufacture choice. 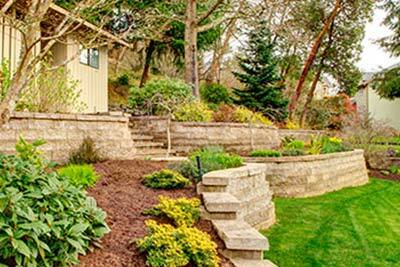 Contra Costa Pavers Stone and Landscape offer landscaping design and installation services. Our experience incorporates design of large projects with complex installation and irrigation requirements as well as smaller landscape needs that enhance existing hardscape scenes. We uniquely combine client wishes, environment and budget to satisfy the needs and wishes of our customers. This popular trend turns the outdoors into extended indoor beauty and uses. From custom kitchen units made from scratch in size and style to installation and finalization of pre-formed styles, our experience completes the process to meet each customer’s specific needs. 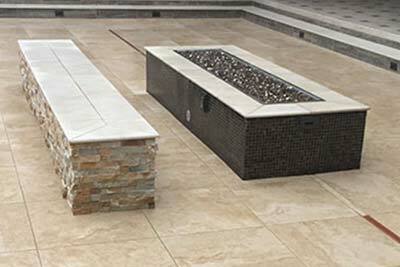 Stucco finishes, stone clad finishes, granite, tile or marble counter tops and an array of appliance choices can complete designs for any outdoor BBQ’er and party planner. Fire pits range from store bought we install to custom shapes and sizes with beautiful stone or tile finishing. 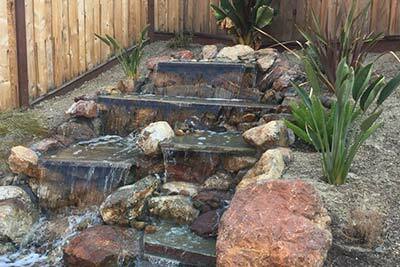 Romantic and peaceful can easily be added into your landscape ideas through the use of water movement and sound. A unique and impressive skill lies within the Contra Costa set of specialties with this amazing feature. We often install the necessary water basins for pre-manufactured units, but it is the plush finish of custom falls that have awed us at their finish. Call on our team to make your unique idea a reality. Our skilled, experienced designers will meet with you to review the site, listen to your desires and dreams and provide a comprehensive evaluation with design ideas. We offer FREE basic drawings and formal proposals to all clients. 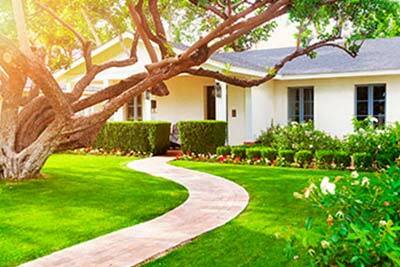 Complete Landscape Architecture drawings are also available. All demo and hauling services needed to complete all our landscape and hardscape projects are performed by our skilled equipment operators. All are licensed and insured as required by our contractor license. Lighting makes the look complete. Whether path lights, spot lights, step lights or any of the multiple choices available in today’s markets we’re there to assist in making the right choice. Transformers are installed to handle the timing and operation throughout the area leaving it a fully automatic system. Drip systems and sprinkler systems are designed and installed according to the needs of the landscape choices on each project. Our expert landscapers have years of experience in the proper choices and operation of the irrigation timers and controllers including new styles with remote and phone operation. Coupled with landscape and hardscape projects, Contra Costa often adds the replacement or repair of existing fences and decks. Each circumstance is closely evaluated to determine the potential of this services.